vegetables, green beans, and cranberry sauce. What a blessing it was to enjoy Thanksgiving dinner at the home of my brother-in-law and sister-in-law, who, despite my insistence not to alter the menu to accomodate Joy's and my preferences, were open-minded and receptive to us bringing our own "turkey", along with the sides and dessert we shared. Although they cooked a turkey and ham for their guests, they prepared side dishes and appetizers with us in mind, offering fresh fruit and veggie appetizers as well as a delicious corn and bean salsa. The sides served with dinner included mashed potatoes, stuffing, and the vegan green beans and sweet potato casserole we contributed to the meal. It was basically a very traditional Thanksgiving dinner. I was pleased that we were welcomed with open arms and not ridiculed or criticized for our choice of a vegan alternative to the traditional turkey and dressing. 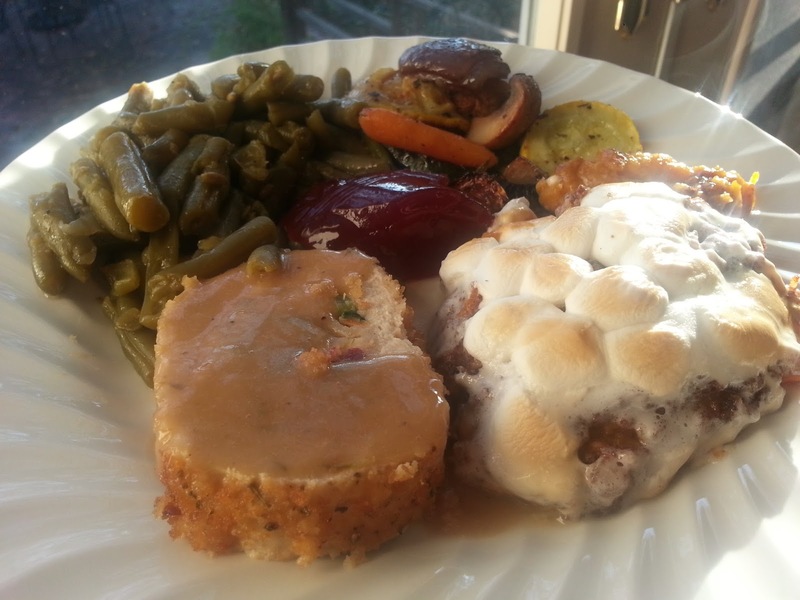 My brother-in-law and a couple of other family guests even tried a bit of the Gardein Holiday Roast and were as amazed as we were that the texture and taste were so similar to turkey. We were able to share information about things like vegan wines and how to make simple changes to recipes, such as replacing dairy and eggs with other ingredients to make the delicious "from scratch" cake we enjoyed for dessert. Joy would agree -- our first vegan Thanksgiving was a success. Everyone enjoyed their meal -- vegans and non-vegans alike -- and we all got along despite our differences. Truly a good time and great food were had by all!